Between Mother's Day and Mothers and Daughters it's been a rough year at the movies for good ol' mom. Okay, The Meddler was pretty good but not enough people went to see it. It's time for the woman who brought you into this world to have some fun and cut loose, and that's what Bad Moms hopes to deliver when it opens this summer. 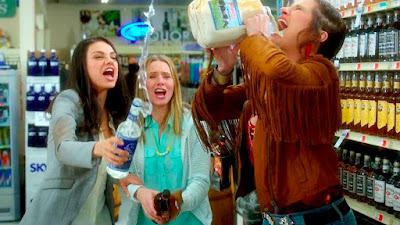 Kathryn Hahn, Mila Kunis, and Kristen Bell are the titular are the titular matriarchs who grow fed up with the expectations and responsibilities heaped upon them. Their solution is to lash out against so they lash out against the seemingly perfect moms played by Christine Applegate, Jada Pinkett Smith, and Annie Mumolo. The result is a film that looks like The Hangover for ladies, which makes sense considering it comes from Jon Lucas and Scott Moore who introduced us to "The Wolfpack" back in 2009. Bad Moms hits theaters on July 29th. Check out red and green band versions of the trailer below.